Sustainable Monroe Township formed in 2013, in order to coordinate the Townships certification process in the Sustainable Jersey Program. As required, we formed a “Green Team” and got to work. We coordinated with our Monroe Township Schools, Residents, Businesses, Municipal Departments, and related organizations to work on the Actions needed for Certification. After submitting our certification for the third time, we were awarded Bronze Certification in November, 2016. In addition to attaining bronze certification, Monroe Township was also the recipient of the Rookie of the Year Award. This award recognizes a newly certified municipality that overcame challenges by effectively leveraging a wide range of internal and external resources to achieve success. In 2016, we became a registered NJ Nonprofit, and initiated the Williamstown Organic Community Garden. The Garden is located behind the Free Public Library, 713 Marsha Ave, Williamstown, NJ 08094. This project generated a lot of Community interest, and we hope to see the Garden blossom into a great community space! We host monthly events at the Garden, and are looking forward to “growing” the Garden with additional members every year. 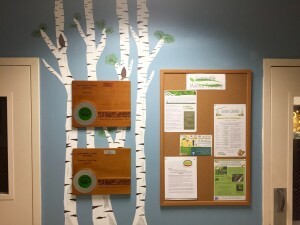 The Sustainable Jersey Certification & “Rookie of the year” awards were hung in the 1st floor main hallway of Town Hall, 125 Virginia Ave, Williamstown. Along with the awards is the current events listing the activities of Sustainable Monroe Township & the Williamstown Organic Community Garden. Our mission is to “achieve a sustainable New Jersey, one community at a time” through a comprehensive program that helps each municipality and school achieve their goals for the future, while making a collective impact toward our statewide goals. Our vision is a healthy, just, and efficient New Jersey where all decisions are made with future sustainability in mind. We bring together major public and private actors at the state and local level to align priorities and resources and support action in the 565 municipalities and over 2,500 schools in the state. The effort comes together through our voluntary sustainability certification programs for schools and municipalities.